As I write this post, it’s hovering in the teens and the snow is lightly coming down. It’s cold in Colorado, that's for certain! Looking out my window, I see snow and bare trees. On my computer, I’m chatting with my friend Paula. She lives far away, but we keep in touch almost daily through an internet chat gadget. All of this is leading me to the challenge I have for you today. supplies: cardstock, Bazzill; chairs, ladies, “today,” & sign, letter stickers, Studio Calico; envelope, Maya Road; pearls, Prima; pen, Sakura; paint, Claudine Hellmuth Studios; adhesive, Scrapbook Adhesives and Making Memories; other, floss. Scrap a page about what you are doing RIGHT now. And for bonus points, use a color scheme that you see right now. I scrapped about how much I enjoy chatting with Paula. In the envelope, I have a little bit more about the history of our friendship. I used the white Bazzill Swiss Dot paper for my background, added some blue to bring an even colder feel to the page, but it was the ladies and chairs from Studio Calico’s new Home Front line that reminded me of chatting for hours with a good friend and made me want to use it. I added some brown for the trees and then a hopeful bit of yellow. I’d love to see what you come up with. It’s important to scrap your memories, but it’s also important to scrap the here and now sometimes! By now you’ve seen the announcement and have started to hear rumblings of a 2010 scrapbooking challenge. You may have heard the name BECKY FLECK associated with it as well. 2010 is just a few short days away, so I wanted to prepare you for the year ahead and encourage you to participate in what will make a great addition to your scrapbook albums – in 12 easy steps! Project 12 started out as a compromise to the yearly challenge of taking 365 photos. I know I am not organized enough to remember to do something like that on a daily basis, so the idea of that challenge was very overwhelming. I thought it would be much easier to summarize my life on a monthly basis, and that is the concept of Project 12. The Project 12 challenge is simple. The idea is to create a layout on a monthly basis which recaps what you’ve been doing. Whether you took 31 photos, no photos, or 100 photos, simply choose your favorites that best described what you were doing that month, and create a layout. I simply went through the photos I had taken the previous month, and picked my favorites. Sometimes I chose a photo because of a particular event, and often I chose a photo because I happened to like it. I tried to keep my album cohesive by using a double page layout on kraft cardstock, and a monthly calendar to note the month. The beautiful thing about your 2010 album is that some of the work has been done for you by way of Becky’s sketches. Every month the sketch will be a little different, but at the end of the year, you will have a cohesive album as each sketch will have similar elements. When creating your layouts, you can use one of Becky's sketches we will be sharing with you each month, or you can come up with your own design. You can also use the same sketch for the entire year. When it comes to this challenge, the decision on design is up to you. Are you excited? I am more than excited to host the challenge with Becky’s help this year. How creative and interesting! Becky Fleck is so smart! January 1 - what were you doing New Years Day? Winter/Snow photos – Summer, for my Aussie friends. Here is the timeline of new sketch releases and reveal dates for the year! In order to be entered into a challenge (and there are some great prizes! 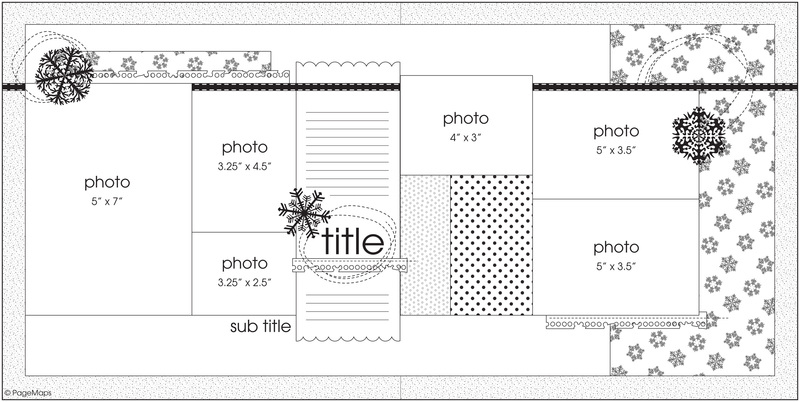 ), simply create a layout and link it to the monthly challenge thread right here by the 20th of the month or send it to us at ideas@scrapbookandcards.com. That means January’s sketch will be due on February 20th and so on. For a second chance to win, link your layout to my blog http://davinie.blogspot.com and the corresponding challenge thread. And, for more exciting news…to kick off Project 12 Becky Fleck has given us an autographed copy of her bestselling book PageMaps! This amazing book includes over 140 artwork examples AND laminated cards with each of the sketches on them – perfect when you need some inspiration. To win this prize we want you to tell two friends about Project 12! For a chance to win this fabulous prize, leave a comment here telling us the first name and last initial of the people you have told about Project 12! If you have any questions about Project 12, please feel free to leave a comment here or email us at ideas@scrapbookandcards.com! Now start thinking about the photos you wish to in January and join us here on January 30th for the next sketch reveal! 12 Days of Holiday Giving Winners! Thank you so much for checking back with us for the names of all the winners! Before we announce the winners of our “12 days of holiday giving” we would like to thank our incredibly generous sponsors for once again providing us with some of the best products out there to give to YOU. We also want to thank YOU for making the “12 days of holiday giving” so much fun! The entire SCT team has enjoyed reading all your amazing comments and we were thrilled to hear from readers all over the world! In fact, yesterday you set a record on this blog as being the highest visited day since its launch in June, 2008! THANK YOU we hope you will continue to visit us each day! "ooohhhhh, ahhhhhh is right! What a fabulous item to stat your holiday gifting! I promise to give it a loving home and I have the perfect spot to hang it! Thanks for a wonderful blog and a great opportunity!" "Wow, what a fabulous give-away! I have wanted one of these ever since I first saw it - what a great tool! Thanks for a chance to win!" "I adore anything and everything Basic Grey! How adorable your giving away different colors to Scrapbook Adhesives E-Z Runners! Thank you and thank Basic Grey and Scrapbook Adhesives for a chance to win a fablous prize! Happy Holidays to all!" "Santa's Workshop!! Oh, I LOVE this from Quickutz ~ this is an incredible giveaway...thank you SO much for the chance to win....I LOVE making albums...this would be PERFECT for me ~ good luck everyone!!" "There's nothing I would love to see more under my tree this year than the Merrymint line! :) Thanks for the chance!" "OOH - I saw that paper showcased in your most recent publication and thought it was adorable! What a great prize package! Scor-pals are THE BEST!!!" "Oh my goodness, this is an awesome gift!!! I would love this, love love love it! Thanks for the chance to win!" "Wow! How cute is that tree album, and it comes with stamps!!! Great giveaway! I love Jillibean Soup and am dying to try the new corrugated alphas! Thanks for another great chance to win! Can't wait to see what you have in store for us tomorrow!" "What a great idea putting everything together in it's own carrying case. Great for toting off to the crops. Now, if only there was a gorgeous assistant to carry it all for me!" "i love this paper.. it is so different from all the others and would be SUPERB in my little hands! Happy Holidays SCT!" "This is an absolutely fabulous giveaway and I can't believe I have a chance to win Upsy Daisy Designs package and Stamping Bella together. You guys are great to give us these opportunities and I thank you so much even if I don't win, but I hope that I do." "Another awesome giveaway! :) Merry Christmas to the whole SCT team... you guys rock!" Congratulations to all our winners! We will contact you within the next week to get your mailing details. We wish you a very happy holiday – whether you celebrate Christmas, another holiday or just celebrate having some time off with family and friends – have a wonderful time together! ps…be sure to visit us on Saturday for the launch of Project 12! 12 Days of Holiday Giving - Last Chance to Enter! Comments for "12 days of holiday giving" are now closed. Good morning everyone! Remember you have just a few more hours to leave a comment on each of our "12 days of holiday giving”! Comments will close today at 12:00 p.m. EST and we will be announcing the winners at 6:00 p.m. EST tonight…be sure to check back to see if you are a winner! Here is a recap of the fabulous list of goodies our partners have given us...to give to YOU! But guess what? That is not all! Our friends at Shabby Green Door are launching a new line in January 2010. For those of you who know me, I am not a patient person and I begged Cassandra (and I mean really begged!) to share some of the new designs with us. I told her that our readers have been so good all year that they deserved to be the first to see this collection. So, Cassandra agreed and guess what SCT readers, you are absolutely the first to see this collection! How great is that! Without further ado, here is "on the wings of a dream" just for you! To make this day even sweeter, Cassandra also included a marketplace ticket for Paperie Arte taking place in Pasco WA on March 12th and 13th! This event includes 2 glorious days of vintage style with 6 classes in an elegant setting. Oh how I wish I lived just a little closer! More information about this event can be found right here. As a final thank you for being the best readers ever, we wanted one lucky winner to enjoy SCT being delivered right to their doorstep. Today's winner will receive a one year subscription to SCT starting with our latest winter issue! If you think this prize is for you (and you know it is! ), just leave a comment right here to enter to win! And, if you have missed any of our amazing giveaways from days 1 - 11, you can still enter (comments close at 12:00 p.m. EST on December 24) Here is the fabulous list of goodies our partners have given us...to give to you! Good luck to everyone who took the time to leave us such wonderful comments. Did it take some work to put this all together...sure it did but it was absolutely worth it! Now we are just putting the finishing touches on our Project 12 launch so be sure to join us on December 26th - I promise it will be another wonderful, giving kind of day...lol! We at Scrapbook & Cards Today wish you hope, joy and peace – days filled with warmth and sun, love and friendship and laughter and happiness! Happy holidays!